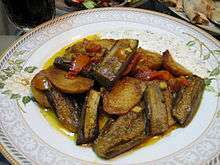 Imam bayildi (Turkish: İmambayıldı, literally: "the imam fainted"; is a dish in Ottoman cuisine consisting of whole eggplant stuffed with onion, garlic and tomatoes, and simmered in olive oil. It is one of the most notable zeytinyağlı (olive oil-based) dishes and is found in most of the formerly Ottoman regions. The dish is served at room temperature or warm. Imam bayildi is also well known under the Turkish name under minor variants of the Turkish name: Bulgaria, Israel, Greece (ιμάμ (μπαϊλντί)), Albania, Armenia, and the Arab world (إمام بايلدي imām bāyuldi). A similar dish is popular in Iran, although various other vegetables and herbs may also be added to the filling. Karnıyarık, which also contains minced meat and is served hot. ↑ Jennifer Speake, Mark LaFlaur. "imam bayildi.". The Oxford Essential Dictionary of Foreign Terms in English. Oxford University Press. Retrieved 2008-04-16. ↑ Hugh Fearnley-Whittingstall (15 October 2010). "Hugh Fearnley-Whittingstall's aubergine recipes". The Guardian. Retrieved 12 May 2015. ↑ Marie Karam Khayat and Margaret Clark Keatinge, Food from the Arab World, Khayats, Beirut, 1961. ↑ John Auto, The Glutton's Glossary: A Dictionary of Food and Drink Terms, Routledge, 1990, ISBN 0-415-02647-4, p. 146. ↑ Gregory McNamee Movable Feasts: The History, Science, and Lore of Food, Greenwood Publishing Group, 2006, ISBN 0-275-98931-3, p. 82.